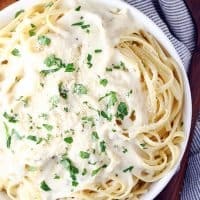 SLOW COOKER ALFREDO SAUCE — Creamy Alfredo sauce with Parmesan cheese and chicken broth simmers all day in your slow cooker. I love Alfredo sauce, but I would definitely gain a thousand pounds if we ate it at every meal, so that’s not going to happen. 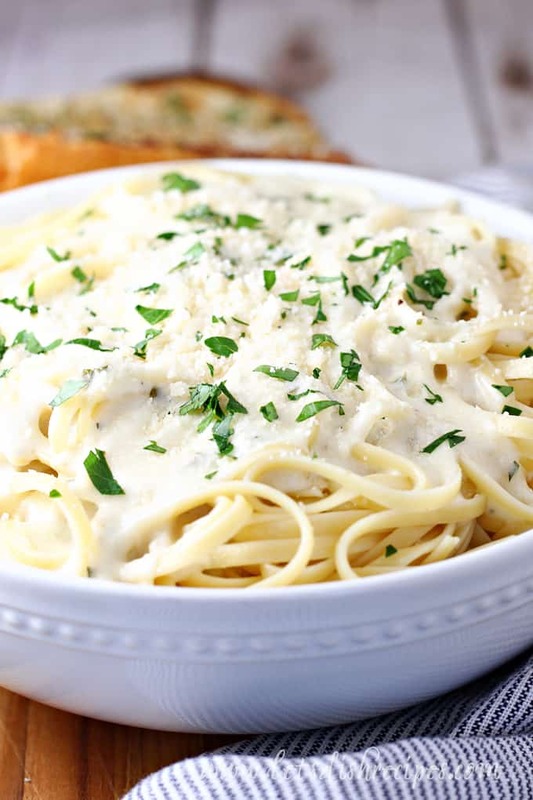 But we’ll probably have it a lot more often now that we have an amazing recipe for Slow Cooker Alfredo Sauce. To say my boys love Alfredo sauce would be a huge understatement. Huge! They certainly wouldn’t complain if I served it at every meal. 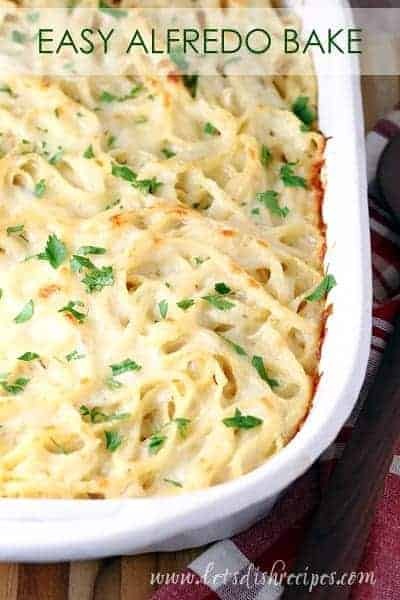 Alfredo sauce isn’t super complicated to make in the first place, but being able to do it in the slow cooker is so convenient if you have a busy day planned. 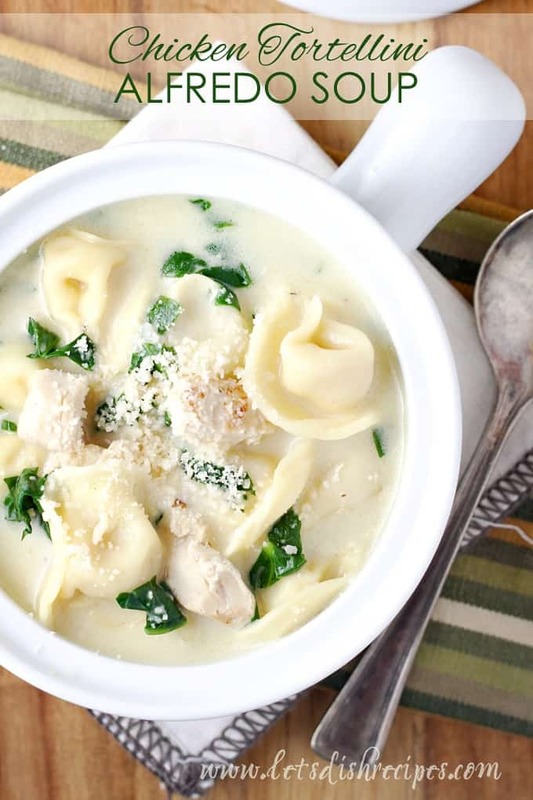 My husband actually prefers it to the usual Alfredo sauce because it’s a bit lighter–there is actually more chicken broth in the recipe than cream. This recipe does make a lot of sauce! Which means we can have it for dinner and then my boys will happily eat the leftovers for lunch the next few days. And if we don’t feel like straight up Alfredo sauce, I use the leftovers to make some kind of cheesy pasta bake. I recommend serving this rich, creamy sauce with fettuccine or linguine, but any pasta will do. And you can always add chicken, shrimp or vegetables for a more hearty meal. This sauce is a staple at our house because I know when I serve it, everyone will clean their plates without complaint. I hope you love it as much as we do! 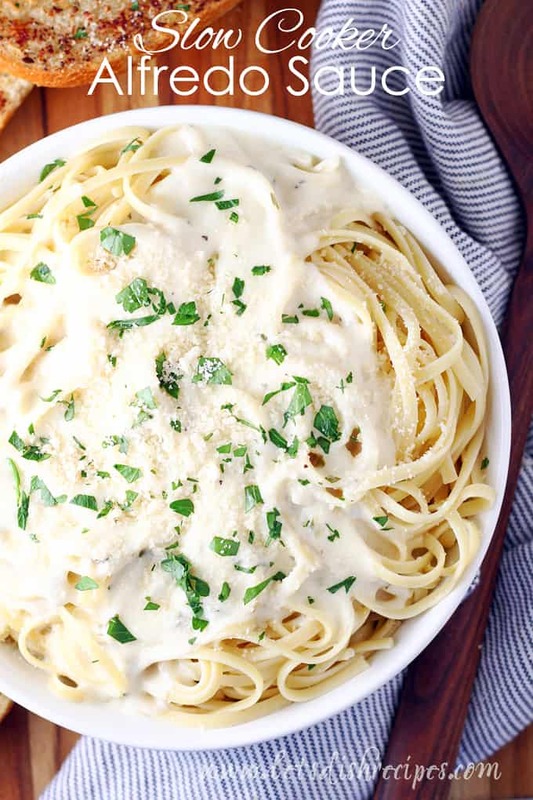 Be sure to save this Slow Cooker Alfredo Sauce recipe to your favorite Pinterest board for later. Creamy Alfredo sauce with Parmesan cheese and chicken broth simmers all day in your slow cooker. Lightly grease the bowl of a slow cooker. Add broth, cream and garlic. Cover and cook on low for 4-6 hours. About 30 minutes before serving, combine soft butter, flour and parsley in a small bowl. Whisk butter mixture into the slow cooker until smooth. Cover and continue cooking for another 30 minutes, or until mixture is thickened. Stir in Parmesan cheese. Serve over cooked pasta. Garnish with additional parsley and Parmesan cheese, if desired. For every 8 ounces of cooked pasta, use about 1 1/4 cups of sauce. Store leftovers in an airtight container in the refrigerator for up to 3 days. I’ve made this three times now and cannot seem to understand why it is so runny. Is it because the slow cooker creates so much additional liquid? The flavor is excellent and it’s perfect for making a large amount with minimal effort. Any suggestions on liquid reduction without compromising the flavor? Hmmm? I’ve never had an issue with thickness. Maybe it’s just a preference of how thick we like our sauce? I would just reduce the amount of broth you start with, or make more of the butter/flour roux, and possibly cook it a bit longer after you’ve added the thickener. Can I add checked breast to this and let it cook in the sauce??? I haven’t tried that but I think it would work. That sounds amazing! Can’t wait to try it! Finally got back around to making this again after previous runny results. Used paper towels and man oh man! Did the trick just perfectly!! Thanks! I made the first part step by step, came home right before needing to add the roux and when I stirred the food the cream and broth separated, it looked liked it has curdeled. Don’t know why. You could use an emulsifier blender to “pull” it back together. I added a brick of cream cheese to the recipe and used my emulsifier to blend it to a nice velvety texture. I’ve found for whatever reason when I add cream cheese to a cream base it doesn’t separate and look curdled. I made this today with chicken breast, it is very tasty… The only thing I found I wasn’t happy with was it seemed to curdle slightly, have you had this happen? I haven’t, so it’s hard to say what happened. Glad you still liked it though. This was so good! Just perfect for my family of 4. I do have a question I’m hoping someone can help me with. Can you freeze the base sauce? Maybe defrost it, warm it and then add the parmesan cheese. 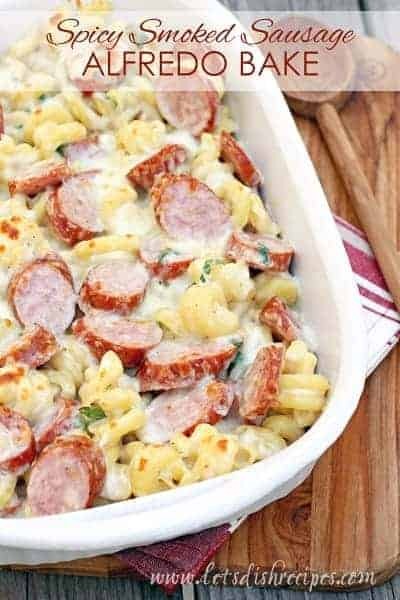 I love cooking in my Crock-Pot and this is one I would love to have on hand in my freezer. Thank you for a great recipe. I had a question I’m putting the sauce on high and I’m cooking the sauce for 1 hour will it still work that way? I haven’t tried it, but I think so. Have you tried adding lemon? I haven’t but I bet it would be delicious! I have not tried freezing it, so I can’t say for sure, but I think it would work. I’d love to know how it goes if you try it! Have you doubled this recipe in the crockpot before? Would you change any directions if you did? I haven’t, but I wouldn’t change anything (besides doubling the amounts, of course), if I did.